I bought one of these clocks in Hong Kong and then found the only instructions were in Chinese, which I do not read. I have got a translation from a colleague and have successfully tested it on the actual clock. Note that if the lithium battery used to remember the time when the power is off goes completely flat the clock stops working even if mains power is present - the display goes out and the clock appears dead. If this happens disconnect the power supply, open the case (five Philips screws) and replace the CR3032 lithium cell (make sure you put in the new cell with the same polarity as the old one). Close the case, reconnect the power and all should be well again. I refer to the buttons by the numbers 1-6, reading from the left. I refer to the indicator lamps as A - Top left, B - top right, C - bottom left, D - bottom right. [D] Voice announcement (in Chinese). To set time push , push  to select digit to adjust, push  to adjust; repeat  and  as necessary, then push  to return to new time at start of minute (in other words - push on time signal). Since the clock reverts to normal operation if no control is pushed for 30 seconds you may push  every 10-15 seconds to keep it in set mode while waiting for the time signal. In Normal Timekeeping mode hold down  for three seconds to toggle between 12 Hour mode and 24 Hour mode. If AM [A] or PM [C] lamp is lit the clock is in 12 Hour mode, if neither is lit it is in 24 Hour mode. Time announcement is available only in 24 Hour mode. 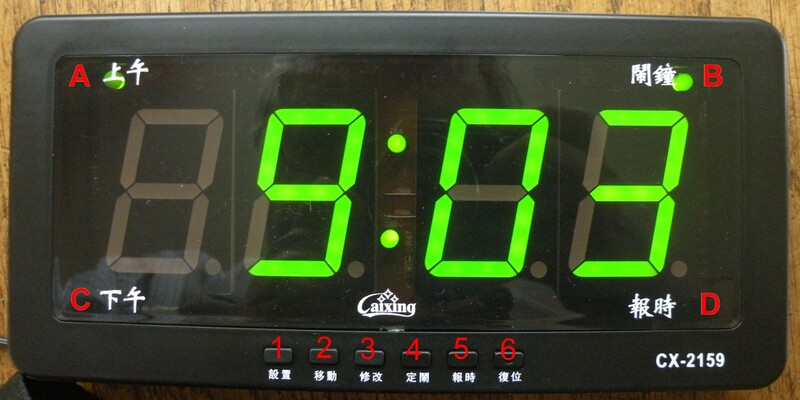 To display alarms (up to 8) from Normal Timekeeping mode press . Alarm time 1 is displayed. Pressing  again steps through alarm times 2, 3, 4, 5,6,7, 8 and then reverts to Normal Timekeeping mode. The display -:-- indicates that that alarm is not set, if the Alarm lamp [B] is not illuminated no alarm is set (but it only goes out when the all the alarms have been unset and the clock is returned to Normal Timekeeping mode). To set an alarm select it as in the previous paragraph, then push , push  to select digit to adjust, push  to adjust; repeat  and  as necessary, then push  to step to the next alarm time. To unset an alarm select it as in the previous paragraph and push . You should see display -:--. (But note that the Alarm lamp [B] does not go out when the all the alarms have been unset until after the clock has been returned to Normal Timekeeping mode). In Normal Timekeeping mode short touches to  toggle the Time Announcement mode. This mode only works if the clock is in 24 Hour mode, and is always disabled between 22:00 and 07:00. The Voice Announcement lamp (D - bottom right) is illuminated if this mode is on.